With Solo opening this weekend, I very much wanted to lead this off with a Han Solo-Juan Soto joke. But I’ve got nothing. 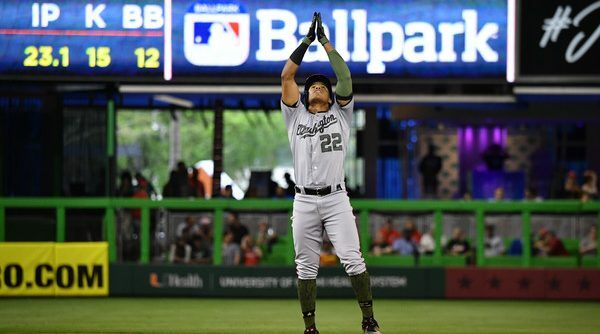 So let’s just talk about Juan Soto, and what he could mean to the Nats going forward, both this season and beyond. Last week, I discussed the Nats’ rampant injury problems and how they’ve addressed them, as well as how they could continue to address them. One of my suggestions was to call up Soto, and voila! He’s here. Unfortunately, it took a season-ending injury to Howie Kendrick, a valuable contributor thus far in Daniel Murphy’s absence and a player the Nats felt comfortable using in the outfield, to prompt Soto’s appearance. The 19-year old phenom immediately made an impact this week, homering off the first pitch he saw in his first start in a Nationals uniform. The next night, Soto drew three walks, showing great plate discipline. On Wednesday, he went 0-for-4, but it’s not like anyone else did damage against the Padres that day anyway. There’s no doubt that no. 22 can contribute to this team and its success as they navigate their way through a now very competitive NL East. With Adam Eaton and Brian Goodwin still on the shelf, Soto can step into an everyday role right away. There are going to be bumps and bruises, but with the prodigious power that Soto has already shown, Davey Martinez should make every effort to get the slugger every at-bat that he can. If Soto can produce anywhere near the level we’ve seen some mid-season or early-season call-ups produce recently (Ronald Acuna and Rhys Hoskins immediately come to mind), the Nats have added what equates to a big trade deadline asset in May. Soto’s bat can take pressure off Bryce Harper, Trea Turner and Anthony Rendon, extending the lineup in the process. It also allows Martinez to run a proper platoon of Matt Adams and Mark Reynolds at first base with Ryan Zimmerman still on the DL. Adams has mashed righties his whole career and Reynolds is always a threat against lefties. Of course, Davey could also slide Soto or Bryce over to centerfield if he wants Adams and Reynolds in the lineup on the same day. It will also be fascinating to see how the outfield situation plays out as Eaton’s return draws closer. Michael Taylor is obviously a great centerfielder, and his bat has shown signs of life lately. But if Soto mashes and Taylor’s struggles at the plate continue, we could see a Soto-Eaton-Harper mix at the 7-8-9 positions once Adam gets healthy. Taylor could become an ace defensive replacement, and Brian Goodwin could then serve as yet another solid depth piece. The Nats’ outfield could look a whole lot deeper come July. Soto’s arrival and potential emergence also makes looking into the Nats’ future irresistible. We haven’t seen Victor Robles in a while, as he’s still dealing with a hyperextended elbow that will probably keep him out for an extended period. But with the potential loss of Bryce Harper to free agency looming, imagining a Nats outfield that includes a slugging Soto and a dynamic Robles softens the blow of losing no. 34. Time will certainly tell. Soto could continue to mash, or he could run into major struggles as he gets acclimated to Major League pitching. But Nats’ fans can’t help but be encouraged by the enthusiasm, energy and batting skills that Soto has already showcased in just a few days with the big league club.